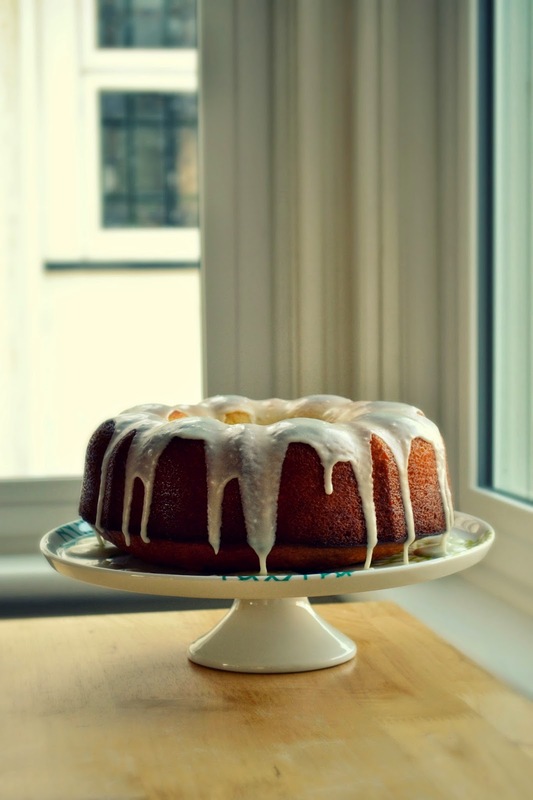 Image: Apple Pecan Bundt Cake from Sweet & Simple by The Canadian Living Test Kitchen (Transcontinental Books, 2015), reproduced with permission. The Canadian Living Test Kitchen is a magical place I sometimes visit in my mind while waiting for water to boil in my west coast kitchen. I think of it as a sort of home cook's paradise hidden somewhere in the heart of downtown Toronto, with acres of counter space, the fully-stocked pantry of my dreams, and those iconic red aprons hung on a row of hooks by the door. 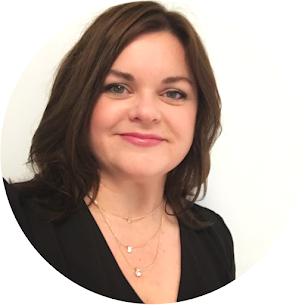 In my mind, Food Director Annabelle Waugh floats from stove to stove singing her instructions while sugared fruit bubbles away in butter pastry, the scent drawing in writers and editors from their desks nearby. 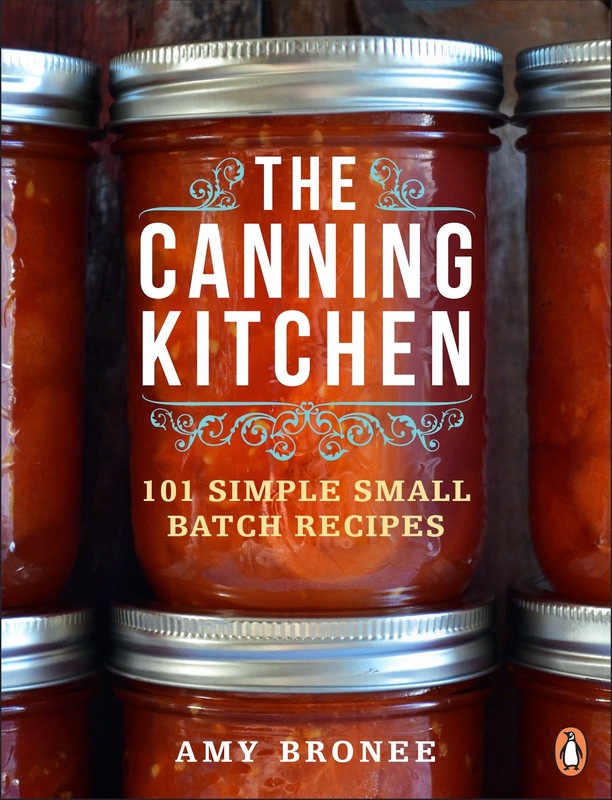 Firmly back in reality, I gladly accepted a review copy of the new Sweet & Simple by The Canadian Living Test Kitchen (Transcontinental Books), out in book stores February 3rd. This collection of 100 recipes lives up to its title - sweet treats for the everyday home baker made with simple ingredients you are likely to keep on hand in the cupboard. While elaborate cakes and confections are fun once in a while, the recipes in this book like Apple Brown Betty (pg. 23) and Cranberry Almond Squares (pg. 62) are the kind of comforting and familiar treats we turn to as home bakers time and time again. Not to say you couldn't serve some of these recipes at your fanciest dinner parties. In fact, Hazelnut Chocolate Mousse (pg. 131) and Berries with Sabayon (pg. 136) would be an elegant finish to any meal. My kids helped me pick which Sweet & Simple recipes to try first. The first choice was Peanut Butter Swirly Brownies (pg. 72). The easy-to-follow recipe resulted in moist, cakey squares that blended chocolate and peanut butter in just the right amounts. Between sharing with friends and family, they were gone within hours and will definitely be made again. The second recipe I tried was Glazed Lemon Poke Cake (pg. 39), which was a little more involved but worth every step. The deliciously moist yet fluffy cake made a spectacular dessert after our Sunday night roast chicken dinner. The most important factor for me when picking up a new recipe book is trust. You are investing time and ingredients and you want recipes that work and taste great. The Canadian Living brand has certainly developed a great deal of trust with its readers since launching its magazine in 1975, and, just like the magazine, Sweet & Simple offers the brand's iconic Tested-Till-Perfect guarantee. There is only one thing I'd change about this book. There are several mouth-watering images within the pages of the book that I think, in my view anyway, would have made an even more eye-catching cover image than the one chosen. But, as with many things, it's what inside that counts most and there is a lot to love inside this book. The pages of my copy are already sticky and well-loved. Scroll down to get the recipe for Apple Pecan Bundt Cake With Caramel Sauce (pg. 40), courtesy of Canadian Living, plus a chance to WIN your very own copy of Sweet & Simple! 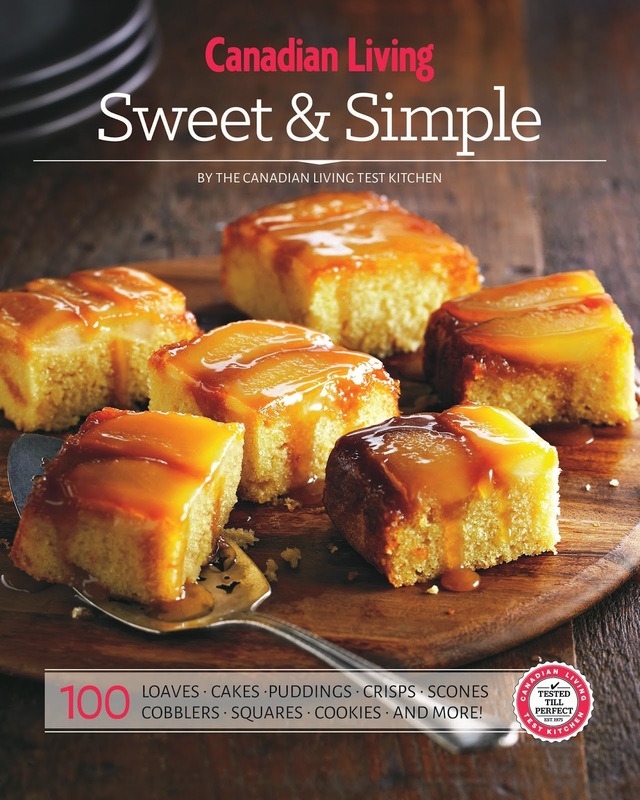 Sweet & Simple by The Canadian Living Test Kitchen (Transcontinental Books) in stores February 3, 2015. Cover image reproduced with permission. Ready for the oven: Peanut Butter Swirly Brownies. Recipe from Sweet & Simple by The Canadian Living Test Kitchen. 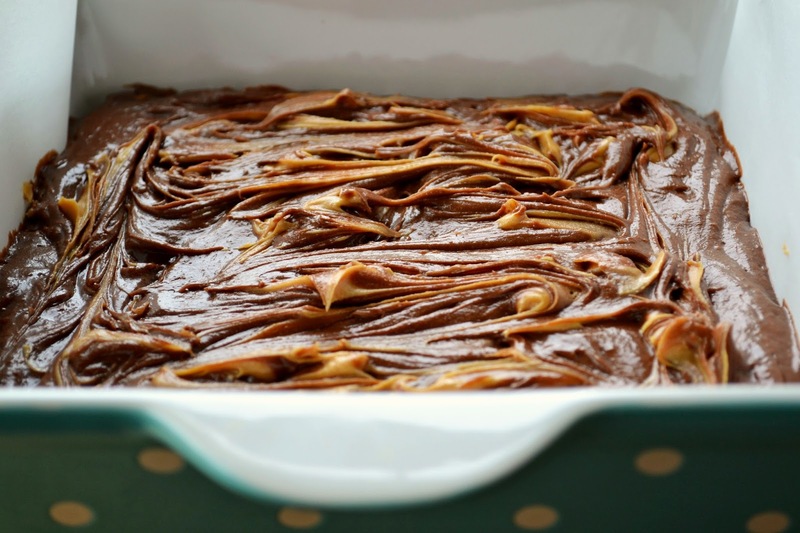 Peanut Butter Swirly Brownies. Recipe from Sweet & Simple by The Canadian Living Test Kitchen. Glazed Lemon Poke Cake. Recipe from Sweet & Simple by The Canadian Living Test Kitchen. Published in Sweet & Simple by The Canadian Living Test Kitchen (Transcontinental Books), reproduced with permission. In large bowl, beat together butter, sugar and vanilla until fluffy. Beat in eggs, one at a time. Beat in sour cream and milk. Whisk together flour, baking powder, baking soda, cinnamon and salt; stir into butter mixture. Stir in apples and three-quarters of the pecans. Scrape into greased and floured 10-inch (3 L) Bundt pan, smoothing top. Bake in 325°F (160°C) oven until cake tester inserted in centre comes out clean, 1 hour. Let cool in pan on rack for 10 minutes. Turn out onto rack; let cool completely. Caramel Sauce: Meanwhile, in saucepan, cook sugar, butter and lemon juice over medium heat, stirring until sugar is dissolved and butter is melted. Cook, without stirring, until light amber colours, about 5 minutes. Remove from heat; sanding back and averting face, stir in cream. Return to heat; cook until slightly thickened, about 1 minute. Pour into large bowl; let cool to lukewarm. Pour half of the caramel sauce over top of cake; sprinkle with remaining pecans. Serve cake with remaining caramel sauce alongside. 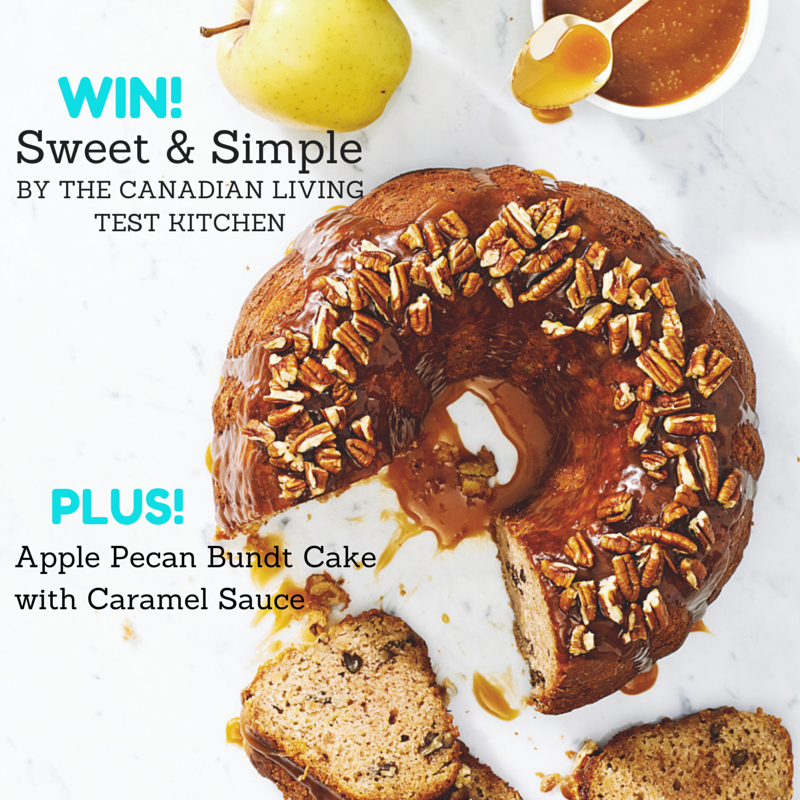 Now for your chance to WIN a copy of Sweet & Simple by The Canadian Living Test Kitchen! To enter the giveaway, leave a comment on this blog post telling me what sweet treat you like to make most. BE SURE TO LEAVE AN EMAIL ADDRESS so I can contact you if you win. Good luck! Contest closes Saturday, February 7, 2015 at 9 p.m. Eastern/6 p.m. Pacific. Canadian residents only. 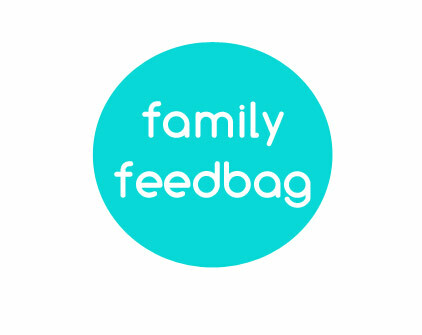 One randomly-selected winner will be contacted directly and announced here on Family Feedbag. UPDATE (Feb 10, 2015): Congrats to Paula Walsh of Acton, Ontario for winning the giveaway! That lemon poke cake looks delicious! I love lemon desserts. Oh yum! And now I want to make those brownies too. I think cupcakes visit my oven the most. My favorite sweet treat to make is mini cupcakes! Apple anything makes my mouth water. Apple pecan bundt cake or apple brown betty Yum! Canadian Living recipes are always a hit. Gotta say it was the Lemon cake that caught my eye and made me hungry! I would try the peanut butter brownies first. Thanks for the giveaway! peanut butter brownies for sure! I want to try those brownies asap! I love Canadian Living recipes. Those brownies are beautiful! Cookies are forever my favourite to make. And also the most dangerous because it's not uncommon that they are all eaten very quickly hehe. Cookies. I swear it's like everyone in my household has a secret cookie monster "dark side" that comes out when cookies are baked. Preferably a childhood favourite, chocolate chip!! Thanks for the give away! Puddings! Yes. 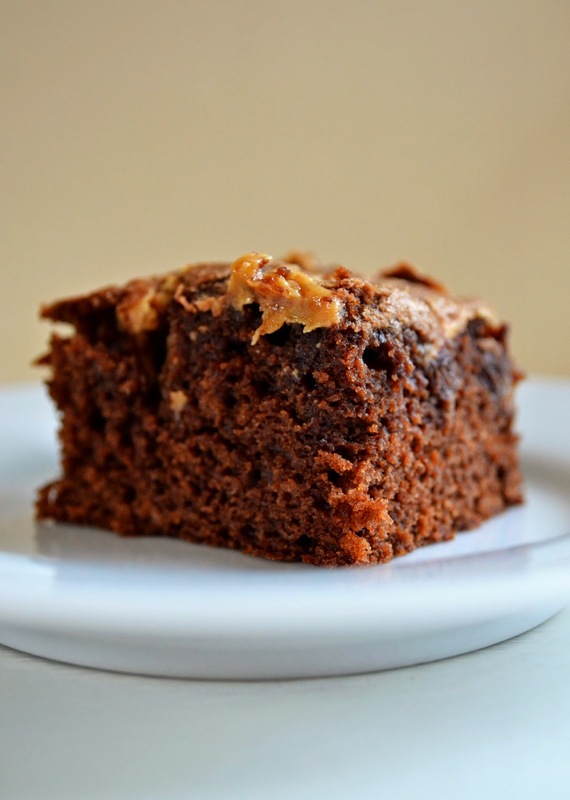 But who can say no to peanut butter in brownies? Not me. Thanks for the giveaway! I love to make chocolate fudge cupcakes with homemade butter cream frosting! Yum! That lemon cake looks delish! Oatmeal chocolate chip cookies are still my favourite sweet treat to bake - I have fond memories of baking them with my mom as a little girl. I've branched out since then, but those cookies will always have a sweet spot in my heart (and tummy). I love making brownies, but I have a lot of lemon lovers in my life, so it's a toss up! I need a new Banana Bread recipe, its my boyfriends favorite and I have tried so many, I need a nice moist recipe. Here's to hoping! 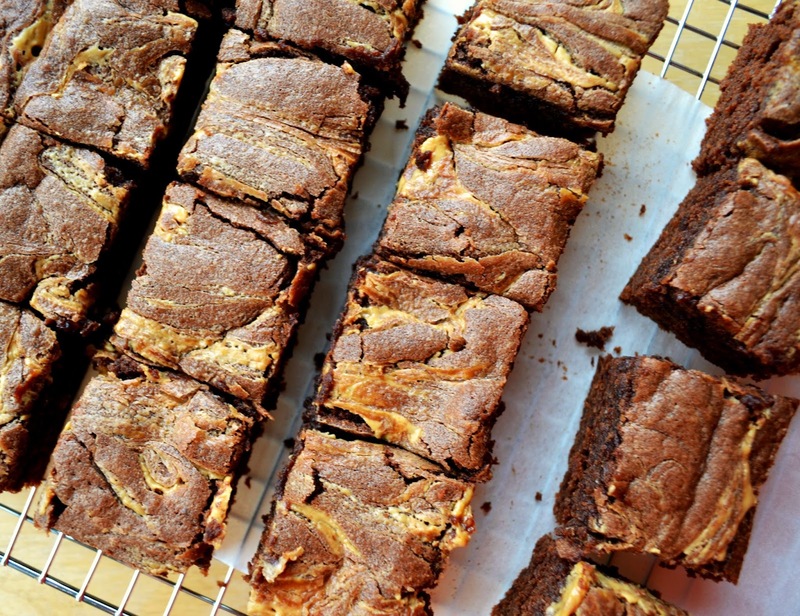 Definitely the peanut butter brownies! Anything lemon or made with lemon curd like lemon meringue pie!